Author: Farrington, Tim Set In . . .
Rebecca Martin is a single mother with an apartment to rent and a sense that she has used up her illusions. I had the romantic thing with my first husband, thank you very much, she tells a hapless suitor. I'm thirty-eight years old, and I've got a daughter learning to read and a job I don't quite like. I don't need the violin music. But when the new tenant in her in-law apartment turns out to be Michael Christopher, on the lam after twenty years in a monastery and smack dab in the middle of a dark night of the soul, Rebecca begins to suspect that she is not as thoroughly disillusioned as she had thought. Her daughter, Mary Martha, is delighted with the new arrival, as is Rebecca's mother, Phoebe, a rollicking widow making a new life for herself among the spiritual eccentrics of the coastal town of Bolinas. Even Rebecca's best friend, Bonnie, once a confirmed cynic in matters of the heart, urges Rebecca on. But none of them, Rebecca feels, understands how complicated and dangerous love actually is. As her unlikely friendship with the ex-monk grows toward something deeper, and Michael wrestles with his despair while adjusting to a second career flipping hamburgers at McDonald's, Rebecca struggles with her own temptation to hope. But it is not until she is brought up short by the realities of life and death that she begins to glimpse the real mystery of love, and the unfathomable depths of faith. Beautifully written and playfully engaging, this novel. is about one man wrestling with his yearning for a life of contemplation and the need for a life of action in the world. 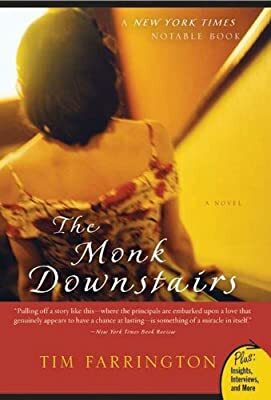 But it's Rebecca's spirit, as well as her relationships with Mary Martha, Phoebe, her irresponsible surfer ex-husband Rory -- and, of course, the monk downstairs -- that makes this story shine.